Home Altruism Moral choices in business: altruism, cynical exploitation, or rational egoism? Moral choices in business: altruism, cynical exploitation, or rational egoism? Having recently concluded teaching an MBA business ethics course, I received unusual feedback from a student. He liked the course but told me that all of it should have been spent on covering the moral code of egoism—rational self-interest—because that is the code he liked the best and considered the most applicable to business. Why was this feedback unusual? To answer that question, some background about the course (which I have taught for over 20 years to MBA, Executive MBA and undergraduate business students) is necessary. After spending the first part of the course discussing values and why we need ethics in the first place, I introduce the main moral codes: altruism, cynical exploitation, and rational egoism. I tell the students that we will spend more time on egoism than on altruism and cynical exploitation, for a few reasons. First, I consider egoism particularly applicable to business and essential to maximizing long-term profits. Second, given the dominance of altruism—the moral code of self-sacrifice—in the culture, the students have had less exposure to egoism and are likely to know much less about it. (For its lack of substantive principles, the code of cynical exploitation gets the least amount of class time). I also tell the students that they need to know what the main alternatives are when it comes to selecting a moral code to guide their choices and actions in business and in life in general so that they can achieve their values, whether a profitable business, a successful career, and a happy life, or something else. Students certainly shouldn’t take my word for it but to assess the moral codes and their implications for themselves. Whether they agree with my assessment is irrelevant for the purposes of the course; I do not grade them for agreement but for their understanding of and the ability to apply all three codes. Almost invariably, in every class I have taught there has been at least one student whose feedback has been: there should be more coverage of altruism and less of egoism in the course. The reasons for such feedback I can only speculate about—perhaps a high level of comfort with the conventional morality of altruism that is usually offered as the only alternative to guide ethical conduct? (For an excellent discussion on the appeal of altruism, read Peter Schwartz’s column in the Huffington Post here). The morality of self-interest seems to be too big of a challenge to some students. On occasion, a student has advocated outright censorship: the teaching of egoism should be banned altogether—because it clashes with the student’s moral beliefs. Therefore, for a student to write that he would prefer to spend the entire course on egoism because he found it the most valuable of the moral codes, was rather surprising. Now, egoism resonates with the majority of students, particularly when they understand that true self-interest cannot involve cynical exploitation of others through initiation of physical force or fraud, but this was the first time that a student has suggested that rational egoism should be the sole focus of the business ethics course. What was my response? I thanked the student for the feedback but told him that while I agree that egoism is the appropriate moral code for business—because business firms by definition must pursue self-interest and to succeed, they must do it ethically—it is necessary to understand the alternative codes. Altruism is generally understood as benevolence and kindness, although the essence of it is self-sacrifice for the sake of others. As such, it is incompatible with business and profit making and will destroy such values. Even if a student does not adopt this code, it is important to understand it because it is used by those who attack business as immoral. For business to defend itself, it is important that those who operate it understand the root of the attacks. Cynical exploitation, often the default moral code and a backlash against prescriptions of altruism, is also important to understand, because it is often confused with rational egoism (which does not permit exploitation). It is necessary to know the difference, as cynical exploitation, like altruism, will lead to destruction. 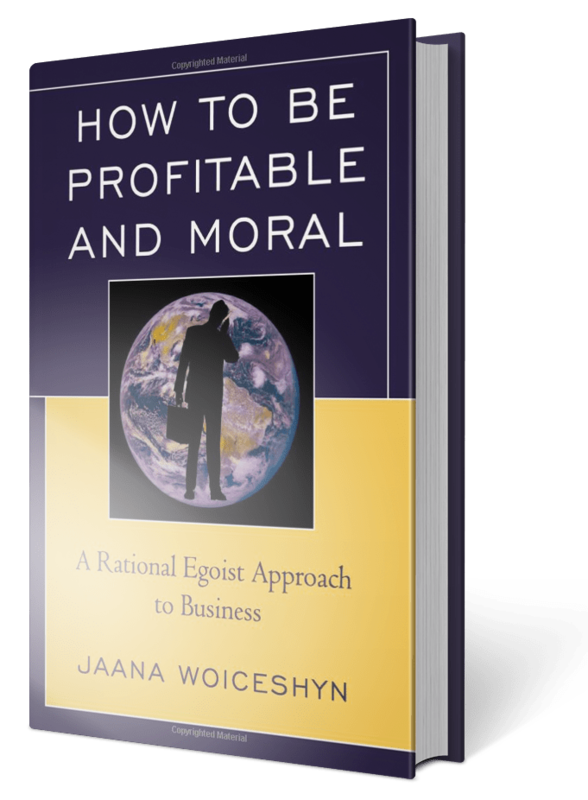 For anyone seeking long-term success and profitability in business, I recommend rational egoism (as explained in my book)—but also knowing the alternatives and their implications. Previous articleIs “green” oil good for us? Next articleDoes acting morally cost you?